It’s been a long time since my first post and I thought I’d start to share my thoughts on my studies for the VMware VCAP exams. 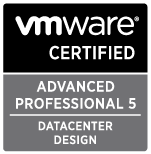 I passed my VCP5 back in December last year which was really good. My study gave me an insight into the new features vSphere 5 has to offer. I’ve thought a lot about whether I should start studying for the DCA or DCD exam over the last few months and have struggled to make my mind up! After much thought and some discussion with a friend of mine I decided to go with the DCD as my first milestone. Since I am working towards the v5 exams it does make things a little harder since there isn’t a lot of information about them yet. I have heard a few things about the recent beta of the DCD but I figure I’ll keep going regardless. I have built a home lab mostly consisting of a desktop pc running an AMD FX 8 core cpu (stop laughing! I like AMD!) and just today received my 32GB of DDR3, yay! With an OCZ ssd and some larger spindle drives I have a pretty good setup whereby I can virtualise MOST of what I need. I figure over time I might need to up the RAM to 64GB, etc but its a good start. I’ve built some template 2k8R2 VM’s using Sammy Bogaert’s great guide to building a lab using workstation (http://boerlowie.wordpress.com/2011/11/30/building-the-ultimate-vsphere-lab-part-1-the-story/). I’ll eventually configure a vCenter server along with Auto Deploy and Update Manager, then move onto deploying two or three virtual ESXi guests. I’m also keen to have a real play with View as I also have some potential applications for this within my work environment so I’ll be exploring these.